In Africa, investors spend significant time and resources in originating quality deals. Add into the mix the comparably small size of African transactions in relation to the global M&A market, and investors find themselves constantly chasing deal flow. 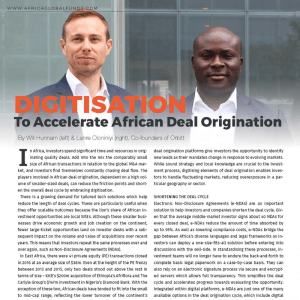 The players involved in African deal origination, dependent on a high volume of smaller-sized deals, can reduce the friction points and shorten the overall deal cycle by embracing digitisation. There is a growing demand for tailored tech solutions which help reduce the length of deal cycles. These are particularly useful when they offer scalable outcomes because the lion’s share of African investment opportunities are local SMEs. Although these smaller businesses drive economic growth and job creation on the continent, fewer large-ticket opportunities land on investor desks with a subsequent impact on the volume and value of acquisitions over recent years. This means that investors repeat the same processes over and over again, such as Non-Disclosure Agreements (NDAs). In East Africa, there were 41 private equity (PE) transactions closed in 2016 at an average size of $38m. Even at the height of the PE frenzy between 2013 and 2015, only two deals stood out above the rest in terms of size – KKR’s $200m acquisition of Ethiopia’s Afriflora and The Carlyle Group’s $147m investment in Nigeria’s Diamond Bank. With the exception of these two, African deals have tended to fit into the small to mid-cap range, reflecting the lower turnover of the continent’s SMEs. In fact, companies with revenues over $100m in Nigeria, Kenya, Ghana, Ethiopia and Côte d’Ivoire represented just 15% of turnover by local businesses in a recent survey. By using standardised tech solutions, investors can close more small-scaled deals in African markets and address inefficient capital allocation. Embracing technology also helps investment professionals keep pace with volatile local markets, prone to external economic shocks. Investor appetite in Africa can change at the drop of a hat due to unpredictable commodity-dependent economies. For example, in 2016, investor interest in Nigeria’s FMCG sector cooled off after local manufacturers struggled to access scarce Forex to import raw materials after the economy plunged into a deep recession. Neither is it uncommon for trade finance funds to adjust their mandates depending on price volatility and default risk with agricultural commodities being the obvious case. For instance, after the international cocoa price collapsed in 2016, the availability of international structured trade finance shrivelled up for Cote d’Ivoire’s cocoa exporters. Digital deal origination platforms give investors the opportunity to identify new leads as their mandates change in response to evolving markets. While sound strategy and local knowledge are crucial to the investment process, digitising elements of deal origination enables investors to handle fluctuating markets, reducing overexposure in a particular geography or sector. Electronic Non-Disclosure Agreements (e-NDAs) are an important solution to help investors and companies shorten the deal cycle. Given that the average middle-market investor signs about 40 NDAs for every closed deal, e-NDAs reduce the amount of time absorbed by up to 95%. As well as lowering compliance costs, e-NDAs bridge the gap between Africa’s diverse languages and legal frameworks as investors can deploy a one-size-fits-all solution before entering into discussions with the sell-side. In standardising these processes, investment teams will no longer have to endure the back-and-forth to complete basic legal paperwork on a case-by-case basis. They can also rely on an electronic signature process via secure and encrypted servers which allows full transparency. This simplifies the deal cycle and accelerates progress towards evaluating the opportunity. Integrated within digital platforms, e-NDAs are just one of the many available options in the deal origination cycle, which include digital due diligence, automatic valuation and standardised impact measurement. Adopting digitisation in the African investment ecosystem gives investors, company CEOs and intermediaries a head start. As the continent’s 54 countries, diverse languages and legal frameworks create a highly fragmented investment market, investment professionals must work twice as hard to deploy capital. This is further exacerbated by Africa’s small-sized deal flow. For service providers, like brokers and corporate lawyers who are remunerated with success fees, there are clear incentives to shorten the deal cycle. A smoother deal origination process also allows African companies to raise capital more quickly and efficiently. While businesses across the continent are readily adopting technology and digitisation, the African investment community risks being left behind. But, this need not be the case. By embracing digital solutions, investors will be much better able to locate Africa’s many hidden investment opportunities.